The three-point shot has become an important weapon in basketball today. Like the “closer” specialist in baseball, teams are now depending on players that can hit the three with regularity, even if that is their only function on the team. Over the past few years, we have seen in the NBA a handful of players whose role is to come off the bench and open up the offense by draining a few three-pointers. The poster child for this has been Marquette grad Steve Novak. 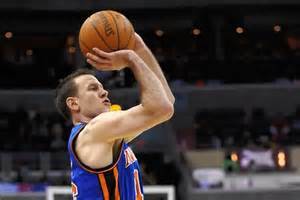 Currently a member of the Oklahoma City Thunder, Novak is in his 10th season in the league. He has played for eight teams in that span. Novak’s role with many of those teams? Come off the bench and give his team some instant offense via the three. And he has been quite good in that role. Novak’s shot selection in his career his been very distinct: In 456 NBA games, Novak has taken 1,704 shots, 1,325 from three-point range and only 379 shots from inside the three-point line. Novak is the only player in NBA history to have made over 500 three-point shots and less than 200 from inside the three-point arc (he has made 572 three-pointers and 175 two-pointers). Novak is also the only player in NBA history to have two seasons where he made more than 100 three-point shots with less than 50 two-point shots made (he did it in the 2011-12 and 2012-13 seasons as a member of the New York Knicks). Following is a look at the eight players in NBA history who made 100 or more three-pointers in a season with less than 50 two-pointers made. Novak is one of three NBA players who has made over 500 three-pointers in his career while making less than 500 two-pointers (as noted above Novak has 572 threes and 175 two-pointers). The others: James Jones (409/731) and Daniel Gibson (487/578).